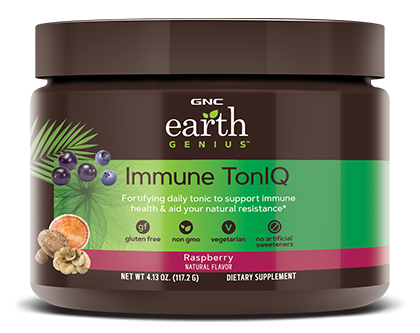 Join the resistance with GNC Earth Genius™ Immune TonIQ. Support your immune health and aid in your natural resistance with this fortifying daily supplement. Use daily for extra immune support. Add one scoop to 8 fl. oz of cold water and mix thoroughly or supplement a smoothie with an extra scoop. Keep out of reach of children. Store in a cool, dry place. Consult your physician prior to using this product if you are pregnant, nursing, taking medication, or have a medical condition. Discontinue use two weeks prior to surgery. , Notice: Significant product settling may occur. immune system got you down? support your natural resistance with Immune TonIQ. what makes it genuis? The unique combination of vitamin C with other superfood antioxidants and organic mushrooms supports immune health and helps aid your natural resistance. Vitamin C is not produced by the human body, so it’s key you add it to your diet. I have a blender bottle, and let it seat for 5 mins. blending inbetween. It desolved for me and used little water, the taste wasn't bad. I got this out my sample box...First time using.. The flavor is almost too subtle but adding lemon juice makes a huge improvement. I tried a blender bottle, the spray nozzle on my sink, stirring with a fork and everything in between. The powder floats on top, sticks to everything and just won’t dissolve. What do the mushrooms do to assist the immune system and are there any hallucinating properties in them please? BEST ANSWER: They are not the mushrooms you are thinking of lol. Look up the benefits of just Reishi and you’ll see. Mushroom benefits are one of the most over looked! Is this okay to take while pregnant? I don’t know, I would just check with your doctor.